Like so many different New Zealand industries, our company defies the "bigger is better" tag; instead we simply work smarter across every facet of our operation. We are committed to sustainability, the acquisition of new manufacturing technologies and technical excellence. To ensure our commitment to continual improvement, we run an internal auditing system based upon ISO standards and are proud holders of the Landcare accreditedEnviromark Diamond award. We are proud to be adding value to one of New Zealand’s most sustainable and highly regarded primary resources. Our collaboration with Woolyarns and our semi-vertical structure allows us to have accountability for our in-house processes. We employ skilled technicians and are committed to fast turn around, small minimum’s and a flexible customer orientated attitude. With the assistance of up to date technology we are able to produce a large variety of qualities, these range from textured and chunky dobbies to delicate sheers made from 100% wool. 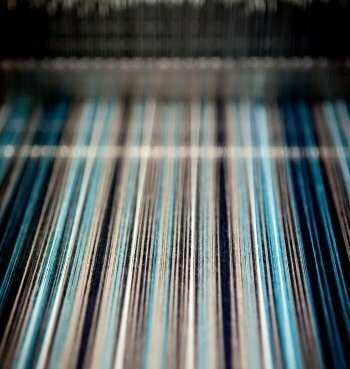 Advanced warping technology allows us to produce varied warp stripes with a range of up to 16 colours and our fully equipped dye house enables exact colour matching in both yarn and fabrics. The dye house work seamlessly with the finishing department to produce a variety of high-tech treatments that allow our fabrics to meet many specifications such as those required for aircraft and other transportation. Here at Inter-Weave we are dedicated to preserving our breathtakingly beautiful environment. Our mill is accredited with the highly prestigious NZ Enviromark diamond award, on an international stage this confirms we are ready for an ISO 14,001 audit. Strict environmental management standards operate within our dye-house, wet and dry finishing and although topical finishes are able to be applied to our product, it is common knowledge that wool is inherently flame retardant without the addition of any chemical treatment.